Connect and expand your USB-C laptop to accommodate up to 10 must-need devices. Quickly turn your MacBook or Windows laptop or tablet into a powerhouse of productivity through a single USB-C cable. Connect a wide variety of devices such as a full-sized keyboard and mouse, an external hard drive, a printer, a microphone, headphones or speaker set, and transfer files through its built-in SD/MicroSD card reader. 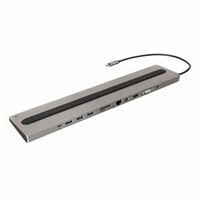 Enjoy the flexibility of the docks versatile video options including 4K resolutions through the HDMI or Mini DisplayPort connections or 1080p video through the VGA port. 13.78" x 0.39" x 2.96"